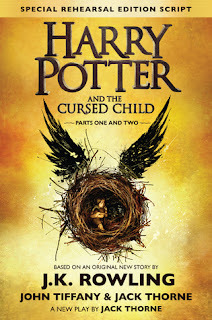 At the time I’m writing this post, Harry Potter and the Cursed Child has been out for less than a month and already has nearly 27,000 Goodreads reviews. Instead of adding my voice to the howling review masses, I thought I’d turn my review into a discussion. 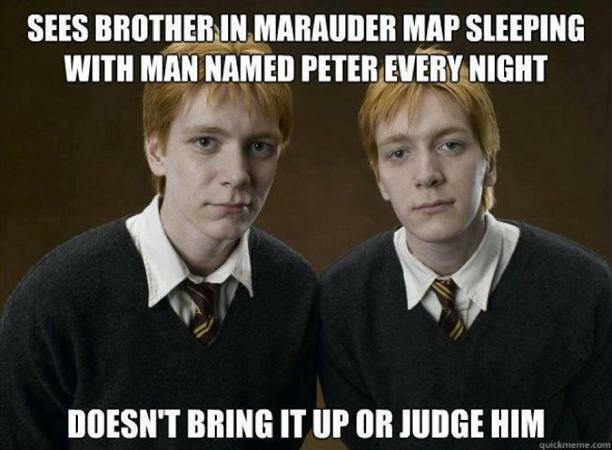 Also, it gives me an excuse to show all of my random Harry Potter memes. This discussion is full of SPOILERS. If you haven’t read the book, turn back now. I’m seriously going to spoil everything. Come back after you’ve read the play. As I was reading Cursed Child, I jotted down my thoughts. I’m going to share them with you. These are mostly my gut reactions to the book. 2. Play scripts are hard to review. The words on the page are only part of the story. I’m missing the actors, the set, the atmosphere of the theater. Would I have a different opinion if I had seen this play instead of read it? 3. Wow, this story is fast-paced. The beginning of the play moves very, very quickly. It’s probably the play equivalent of an info-dump. We gotta get the backstory before we can properly start the plot. 4. I’m nostalgia-ing so hard right now. I love seeing the wizarding world again. 5. Wait . . . what the hell is wrong with Harry? Who is this mean, overly sentimental weirdo? I have an unpleasant image of an angry 40 year-old man cuddling a baby blankie right now. I guess growing up and becoming a parent really does change people. 6. Okay, something is wrong with all of the characters. I can tell this wasn’t written by J.K. Rowling. All of the characters have been reduced to one character trait. 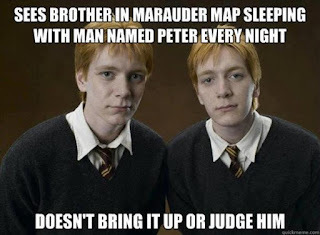 Ron is the funny one. 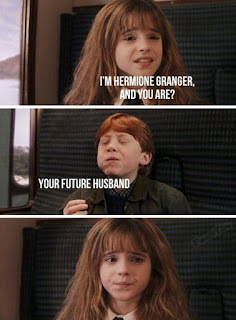 Hermione is the smart one. Why can’t they be more complex? 7. I love the kids. Albus and Scorpius are adorable. Rose is a jerk (and very unlike her parents), but they’re all entertaining. I could get into this story. 8. Are prophetic dreams lame? I know Harry had them in the original series, but prophetic dreams in books always seem like lazy writing to me. 9. The mature relationships are nice to see. Even though Harry’s character is “wrong,” it’s still interesting to see his marriage with Ginny. They seem very supportive of each other. 10. OMG, what’s up with that bookshelf scene? Let me get this straight: Hermione has a time turner that she needs to keep safe. So, she hides it in a book and leaves clues to its location that are simple enough for children to follow? I guess Hermione shouldn’t be left in charge of the wizarding world’s national security. 11. I bet this play would look awesome on stage. I’d love to see how they make the magic work. 12. This time-travel plot is silly and feels like it’s fizzling out quickly. I wish they’d left the past alone and focused on the future. One of the themes seems to be you can’t change the past, but it’s possible to explore that theme without literally traveling to the past. There’s a lot of rehashing of old events. A lot of time-travel tropes. 13. The Voldemort-controlled world is pretty cool. Dark, weird, and creepy. 14. Well, that’s not very feminist. In the universes where Hermione isn’t married to Ron, she’s a miserable hag. Couldn’t she find happiness on her own? Or couldn’t she marry someone who wasn’t her high school sweetheart? 15. Plot twist! Now it’s starting to feel like a Harry Potter book. Delphi is not who she seems. That's cool, but she's Voldemort's daughter? I wish they would have let Voldemort rest in peace. (Or rest in pieces. Remember when he exploded into confetti at the end of the 8th movie?) Anyway, I would have liked a new bad guy instead of resurrecting the old one. 16. Characters are “full of” a lot of stuff. I know it’s just stage direction, but it’s getting repetitive. They’re all “full of” sadness/anger/confusion/insert emotion here. Once again, the writing seems lazy. 17. Plot holes and inconsistencies. Doesn’t polyjuice potion take months to brew? The details of time travel are pretty murky (unless I’m missing something). 18. 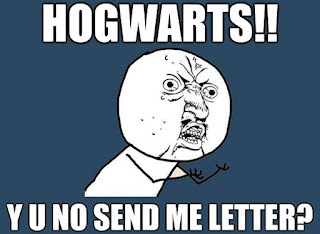 For trained dark wizard hunters, these people sure are incompetent. Delphi defeats most of them with . . . a door? Really? She just locks them behind a door? Aren’t these people aurors? Wouldn’t doors come up in their training? 19. The plot did fizzle. It wasn’t strong enough to be this long. Not enough tension. I wasn’t very invested in the story by the end. At this point in the story, Albus is showing some romantic interest in Delphi. I interpreted this line to mean that Scorpius is romantically interested in Albus. The line says that "part of" Scorpius doesn't like Albus talking to "a girl." It specifically says, a girl. Not "talking to Delphi" or "talking to a new friend." Scorpius has an issue with the fact that his friend is talking to a girl, but the exact issue is never made clear. I spent the rest of the play waiting for something to happen between Albus and Scorpius that would explain why Scorpius doesn't want Albus talking to girls. Nothing did. Why? Did I misinterpret the line? Is Scorpius just afraid he'll lose his friend if Albus gets involved in a relationship? Couldn’t that have been much clearer? Even people who aren’t dense might be thrown off by the line. Was I supposed to be confused? Are the authors using Scorpius’s sexuality as a way to build suspense? (Because the silly plot didn’t have enough?) I’m not a fan of that. It’s not nice to treat a person’s sexuality like a mystery that needs to be solved. Maybe the authors are just trying to be realistic. Scorpius is what, fourteen? Maybe he doesn’t understand his own romantic inclinations, and everything that happens is entirely realistic. But why would the authors hint at a plotline that doesn’t go anywhere? Why put it in the book at all? Overall: Did I like the play? Not really. 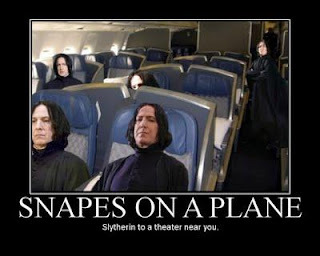 It was fun to be back in the wizarding world, but I don’t think this play adds anything to the series. I wish it would have spent more time focusing on Albus’s future instead of rehashing Harry’s past. 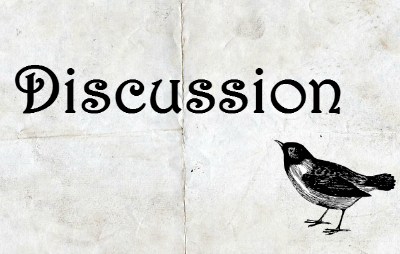 Let’s discuss: What did you think of Harry Potter and the Cursed Child? It seems like we had a lot of similar feelings about this play! I didn't hate it, but I was super confused by a lot of things, and I do think all the characters felt really off. You could definitely tell that it wasn't written by J.K Rowling. I especially thought Harry seemed weird - he was a kid who grew up with no proper family and desperately wanted one, yet he tells his own son that he wishes he was different? 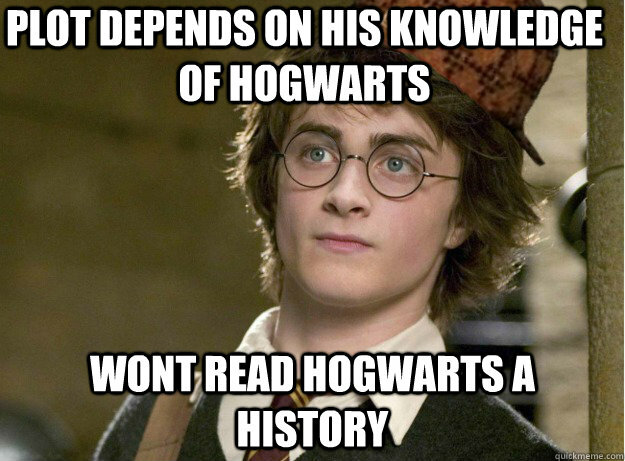 And I couldn't quite get what Albus' problem with Harry was in the first place. I also wasn't a fan of the whole time travel story line, and I would have preferred a new villain instead of basically resurrecting Voldemort too. Defeating Voldemort was the entire plot of the seven book series, so going back in time to reuse him as the villain just seemed like cheating to me. 5) YES! I was so disappointed with how they portrayed Harry in this! He would NEVER say that to his son! Can you imagine?? Family was always the most important thing for him. 6) Yep, I'm absolutely convinced that Rowling had very little to do with the play. I really think she put Albus in Slytherin and made him friends with Scorpius and that's about it. 10) I had the same thought about that! She is the MINISTER OF MAGIC and this is the best way she could figure to hide something? 12) I hated the time travel. Not only did it feel like one big book full of fan service and re-hashing old scenes, but it also doesn't work with the original books! First of all, time turners were destroyed. Second, they can't change the past! That's canon! 14) Hahahaha! Like I said, I doubt Rowling had much to do with this. Weren't the other two authors men? OF COURSE Hermione can't find happiness without a man! 15) This was honestly the most ridiculous part of the book to me. WHEN exactly was Bellatrix pregnant? Because I'm pretty sure everyone saw her during the time when she should have been about to explode and no one commented on her pregnantness... Not to mention, doesn't Dumbledore say Voldemort cannot love? 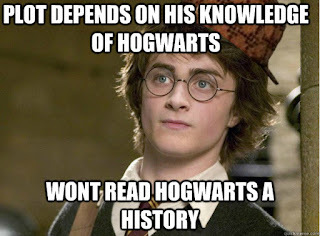 Doesn't Voldemort want Harry dead so no one threatens his power? WHY would he have a kid who could challenge him someday? GAH! So, um, yeah. I love this post! Obviously I also had really strong feelings about this. 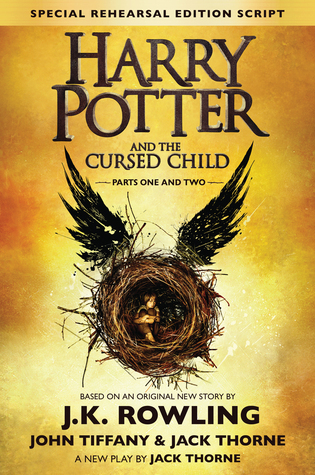 I rated it much higher at first just because it's a Harry Potter book and I couldn't stand giving it a bad rating! But the fact is the story is pretty awful. Everyone keeps saying the play is amazing, but I don't care how many pretty lights they have... Nothing can take away from the Voldemort love child and ridiculous time turner arc. Amazing post! Lol, I think your comment is my longest comment ever. Reading this play made me want to go back and reread the series. I kept coming across little inconsistencies in the play and going, “Is that inconsistent with the series, or am I just making things up?” It’s been a lot of years since I reread the whole series. True story, I just read this so I never, ever have to read the book 😂 Seriously, even though I am not a HP fan myself, I don't think this was a great idea. People aren't very pleased, and I don't know why they thought people WOULD be- especially since it isn't even JK writing it. I enjoyed your take on this though- especially the memes ;) And I don't like that in #20, it was never wrapped up! What even is that? The whole thing seems like a big old mistake. Maybe someone needs to grab that time thingy from Hermione's crappy hiding spot and undo this hot mess. Just saying. I have a lot of the same thoughts about Cursed Child - this play would look amazing on stage, but the characters all feel flat. It doesn't have the same richness as the novels, but I suppose that's what you get for trying to fit 3 years of character development into a couple of hours play. As for that line about Scorpius, I thought it was some sort of jealousy, though it is unclear if it was romantic jealousy or because he was afraid of losing his only friend. I thought the authors didn't delve into it because they already didn't have enough room for all the confusing plot twists as it was! September Currently . . .